In almost every home, there’s that little thing which every light needs – the light switches. When there’s light, there’s light switch. And with home automation technology every growing nowadays, it’s safe to say that everything at home are becoming smart, right? In fact, there are already smart locks, smart thermostats and among other electrical devices and appliances common at home. And of course, we also now have smart wireless light switches. One of these smart light switches is the Belkin WeMo light switch, the wifi-enabled smart light switch. In this Belkin WeMo light switch review, we’ll give you all the details, features, specifications you need to know about this device. And, we’ll give you an in-depth review of this smart light switch. Most importantly, we’ll help you see if this device fits your needs and your lifestyle. Enabled by a wifi connection, WeMo light switch gives you the power and freedom to remotely manage lights or any small appliance using your Smartphone. You can achieve this using their free WeMo App which can be installed in supported Android and iOS devices. For more info, check on the requirements tab. So if you want total control of your lights from anywhere, then this smart device might be perfect for you. All you need is the WeMo App and an internet connection. Whether you on vacation or at home, you can switch your lights in your phone. Yes, it’s pretty cool. The main benefit of making your devices smart is getting the ability to control things at home remotely. Also, you can check the status of your devices at home whether it’s on or off wherever you are. With these, you’ll have the peace of mind knowing you can switch things anytime and anywhere. Enables smart lighting management without the need of a smart hub – this is only an advantage if you are just controlling your lights/small appliances. If not, check the cons. On the other hand, not being able to connect to a smart hub can be a disadvantage. If you want a better home automation setup, you need to have a smart hub or controller which you can connect other smart devices, including your smart light switch, you can manage everything using your smart hub. First of all, be very careful. Physically install the WeMo light switch. Make sure the power is cut off. You can either replace your old normal light switch or install this as a new light switch in your home. After installation, connect your smart light switch to your home wifi network. Install the WeMo mobile app into your smartphone. Connect your mobile app to the WeMo light switch device. The complete WeMo light switch installation guide is here. WeMo smart light switch is good for beginners and DIYers of home automation. If you want simple automation system for your lights and small appliances at home, then this device is a good fit for you. All you need to do is install the smart light switch, connect to your home wifi network, install the mobile app, connect device and mobile app and you’re good to go. But for those who want a more diverse home automation system, this might not be for you. When we say diverse home automation system, we mean that you want to automate a lot of things in your home like temperature settings, dimming of lights, use of smart security systems including door locks, using of sensors and among others. If you are this user, you may want to control every smart device using a smart hub. In summary, the Belkin WeMo light switch is a great device for DIYers and for those who want to have a less complicated home automation system. But if you want to have a smart wifi-connected light switch which you can use to integrate to your smart home which uses a smart hub for centralized home automation system, this might not be the one for you. 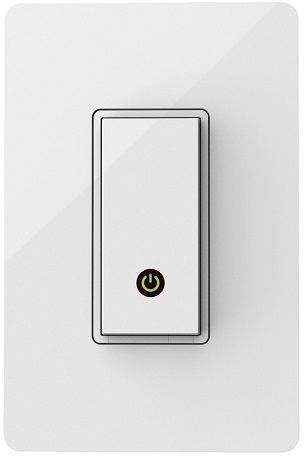 We hope this Belkin WeMo light switch review is helpful to you.